The Whitbread 2000 Book of the Year is a haunting and captivating work of historical fiction for children. The Coram man takes babies and money from desperate mothers, promising to deliver them safely to a Foundling Hospital in London. Instead, he murders them and buries them by the roadside, to the helpless horror of his mentally ill son, Mish. Mish saves one, Aaron, who grows up happily unaware of his history, proving himself a promising musician. As Aaron's new life takes him closer to his real family, the watchful Mish makes a terrible mistake, delivering Aaron and his best friend Toby back into the hands of the Coram man. It tells the story of a dark time in English history. Fans of The Boy in the Striped Pyjamas and Goodnight Mr Tom will love this. A great read for children aged 10+. 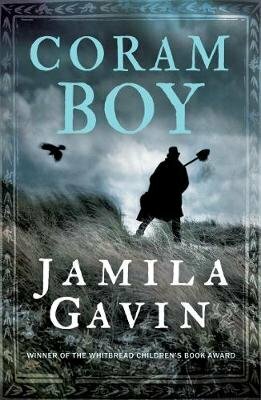 Look out for Jamilla's other titles: The Eye of the Horse The Robber Baron's Daughter The Track of the Wind Wheel of Surya Coram Boy won the 2000 Whitbread Children's Book of the Year, was shortlisted for the Carnegie Medal and has been adapted into a highly acclaimed stage play. Jamila Gavin was born in Mussoorie, India, in the foothills of the Himalayas. With an Indian father and an English mother, she inherited two rich cultures which ran side by side throughout her life, and which always made her feel she belonged to both countries. The family finally settled in England where Jamila completed her schooling, was a music student, worked for the BBC and became a mother of two children. It was then that she began writing children's books, and felt a need to reflect the multi-cultural world in which she and her children now lived.